Hello. I am new to this forum so I am not sure how it works. Today I am getting a created gecko from someone that I know who is not able to care for it anymore and I wanted to come here to get all the information I need to care for them properly. 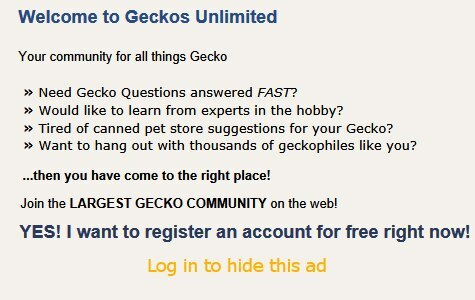 I have done a lot of research on crested geckos and I will continue to do research as I care for them. I am just going to refer to the crested gecko as a he as I do not know their gender at the moment. The precious owners are saying that he may be dying and that he isn’t looking too well and they are giving him to me to try to help him. I absolutely love animals of all sorts and they are basically my entire life and I will do anything to make sure that they are happy and healthy. I do not have him at the moment so I do not know all the details right now. He has a stand up terrarium, I am not sure how big it is. It has fake plants in it that he can climb and hide in and I food and water bowl that I know of but I will be buying him some new bowls for cleanliness. I don’t know what substrate he has but I read that paper towel is good so I will start using that when I get him. I am not sure how often the previous owners fed, watered, or misted him or what temperature they kept him at. I will buy a new separate bottle to use for misting his terrarium every night. As I said before I will buy him new bowls. The room he will be kept in is in the 70s in the day and high 60s at night. I do have a space heater in the room he will be in and I ordered a cool mist humidifier a while ago for the room as well that will hopefully come in soon. I am planning to buy him crickets to feed him 1 or 2 a week and I will buy calcium and D3 to coat them with, and maybe I will even try breeding crickets so I don’t have to buy them so often. That is all for now. Thank you. All replies are appreciated. If you have nothing nice to say don’t say it. I got him the same day that I originally wrote the first part of this thread. He is on top of my dresser. I am still unsure of the size of his terrerium. I think it is an exo terra or something like that. When I got him, he had one of those fake grass green mats that I have seen being sold online but I switched it out with normal paper towels because I heard that that is a good choice. I keep the room he is in at around lower 70s in the day and higher 60s at night. I have a space heater in the room that I turn on every morning for about an hour. Since I have gotten him I have misted his terrorium right in the morning and then later at night so it can dry in between and he can drink the water droplets. He has a water bowl just in case and he has a food bowl which I replaced both from what I was given for him which was just a water bottle cap. I have been feeding him every other day as I read that that is what you are supposed to do. He doesn’t eat all his food on the first night so he still has food left if he gets hungry at all. I also have a bowl at the bottom corner of his terrarium filled with water that was originally supposed to be used for drinking water but it was really big. He can with two pieces of foliage and hopefully I can find more for him. I also want to get him somewhere for him to hide when on the bottom. He seems to like to be on the bottom of the terrerium in the evening. I still haven’t gotten the cool mist humidifier and I am hopefully going to get it soon as I really want and need it ASAP for other reasons. I will need to try to get him crickets, calcium powder and D3 soon. . I think that is all. If I have missed anything I will try to edit or update the information. Thank you. All replies are appreciated. Last edited by ccrested; 03-20-2019 at 11:31 PM. I would be very cautious about a cool mist humidifier. watch that there's no fungal growth over time. can you post a photo of the gecko and of the enclosure? a crested does not need a large water bowl and this will potentially be dangerous for him. I would take it out. if you're misting him heavily 1-2X/day he will be just fine. It is too dark to try to get a good photo at the moment but I will try to post a photo of the enclosure when I can. It isn’t necessarily a “large” water bowl. It isn’t big enough that he wouldn’t be able to climb out if he went in for whatever reason. I don’t even think it is big enough for him to fit inside comfortably, not that he would anyways. Thank you. All replies are appreciated. If you have nothing nice to say, don’t say it. Last edited by ccrested; 03-20-2019 at 11:24 PM. Here are some photos of the gecko and the enclosure. I would recommend getting some more leaves, some hollow bamboo and some twisty vines to fill as much of the empty space as is practical. This will give your new friend more climbing to do and more places to hide - this will help him or her to get enough exercise and entertainment as well as boosting his or her confidence. If you can offer hiding and climbing places at a range of heights this will also help him or her to thermoregulate. While doing research about crested geckos,I read that you only have to do a full clean of their terrerium (clean glass, accessories, food and water bowls) once a week other than spot cleans when needed, is this information correct? Is it okay to just wipe/clean/rinse everything with regular tap water and a goo scrubbing? Another thing, I've read that you are able to use fish tank decorations (castles, fake skulls, so on) for crested geckos. Is that true/safe? How much food am I supposed to provide him? I feed him every other day and change it later in the day because i heard that they eat at night. I have been giving them around 1/2 teaspoon powder to around 1 teaspoon water like it says on the instruction to do 1:2 ratio. I have read that people just say that it depends on how much your crested gecko eats but I don't really notice him eating too much of it. Is it wasteful to just trow out what he doesn't eat? He is being fed a Repashy mix that was given to me by their previous owner. If there is any other crucial information that you feel that I need to know, please don't be scared to tell me. Thank you. All replies are appreciated. If you have nothing nice to say, don't say it. Last edited by ccrested; 03-21-2019 at 01:59 PM. Okay, thank you. I was planning on trying to find some more leaves and a hiding place for them. I will keep an eye out for hallow bamboo and twisty vines. Is there any particular decorations/accessories that are really good to use for crested geckos? Like certain structures to use as something for them to be able to hide in or does it eally matter? Thank you. All replies are appreciated. If you have nothing nice to day, don't say it. I do a spot clean using filtered water and reptile-safe disinfectant whenever the viv looks like it needs it. I also remove faecal matter when I find it somewhere the clean-up crew can't reach. I use a naturalistic substrate that includes springtails (the clean-up crew), who eat any faecal matter that reaches the floor. You're using a different substrate, so you might have a different cleaning regime. I wash the food bowl daily. I make a fresh bowl of Repashy every day in the same ratio as you (1 powder:2 filtered water). My crestie eats a different amount every day depending on how hungry he is but I like to make sure that he has access to fresh food whenever he needs it. I also offer live crickets as a treat. The crickets are gut-loaded and dusted. When my crestie was smaller, he ate more crickets. Now that he's fully grown he only has 1 or 2 a week when he "asks" for them - he has a specific gesture he does when he wants a cricket, not sure how common that behaviour is. I went to a pet store to try to find crickets to feed the crested gecko. We were talking to one of the workers there and asking them questions about what you need to do to feeder crickets like what food to give them, care they require, enclosure to keep them in, and so on. The worker was saying that if you feed the crickets a calcium rich diet that you do not have to dust the crickets with calcium and D3 powder before you give them to your lizard. I just wanted to come her and see if that is true and what you guys thought about the situation. I ended up getting 9 crickets of various size, a critter keeper but sadly not the kind that comes with tubes, and I also got Flucker’s high-calcium cricket diet. One thing I want to say that isn’t important but I still want to include it is that the worker said that I can mix the cricket food with water but the container doesn’t say that I need to. How should it be prepared? I think that is all for now. If I missed any information, I will try to update this post when I can. Thank you. All replies are appreciated. If you have nothing nice to say, don’t say it. Would anyone be able to help me out with the cricket situation? All help is appreciated. Thank you in advance.